I’m so grateful to have had the opportunity to serve the people of Hawaii and our country in so many ways over the years — , in the state house where I was elected at 21, serving 100,000 people as a member of the Honolulu City Council, and now for over 6 years in Congress. Our nation was founded on the principle that our government should be of the people, by the people, and for the people — where all people are treated equally, and with respect, in these UNITED states of America. We are being torn apart by powerful, self-serving politicians and greedy corporations, inciting hatred, fear, and conflict between us because of the color of our skin, the way we worship, or our political party. This corruption of spirit driven by greed and selfishness is eroding the very fabric of our society … and democracy itself. Our men and women in uniform, generation after generation, motivated by love for one another and for our country have been willing to sacrifice everything … for us. They don’t raise their hand and volunteer to serve just to fight for one religion but not another; people of one race but not another; people of one political party but not another. When we raise our right hand and volunteer to serve, we set aside our own interests — to serve our country and to fight for ALL Americans. We serve as one — Indivisible and unbreakable, united by this bond of love for each other and love for our country. I will bring a soldier’s principles to the White House — restoring the values of dignity, honor and respect to the presidency. And above all, love for our people and love of country. Instead of draining the swamp, our president has turned it into a cesspool of corruption. These powerful politicians dishonor the sacrifices made by every one of our service members, and their families — they are the ones who pay the price for these wars. In fact, all Americans pay the price for these wars that have cost us trillions of dollars since 9/11. Every dollar that we spend on regime change wars or the new cold war and nuclear arms race is a dollar coming from our pockets … dollars that should be used to meet the needs of our people and our communities here at home. We must stand united and stand strong against those in both parties who never tire of war — neolibs and neocons dragging us from one regime change war to the next, exacerbating the New Cold War, and pushing us to the brink of a nuclear war. We deserve better. Our country deserves better. Just over a year ago, the people of Hawaii and our country thought we were under nuclear attack. College students frantically ran across campus trying to find shelter. Families piled their kids into the car, driving to the mountains, looking for a cave to shelter in. A mother, in her bathtub, cowering in fear with her child. A father having to choose which of his children to spend the last minutes of his life with. There was no shelter. There was nowhere to hide. Those of us who serve in uniform made a choice — to put our lives on the line to serve our country, willing to pay the ultimate price — we volunteered for that. We chose that. But my 6-year-old nephew Malu didn’t make that choice. You didn’t make that choice. Our families didn’t make that choice. Our troops volunteer to serve our country, to go to battle to defeat those who threaten us, to keep the American people safe. To make it so that while they’re fighting on the front lines, your children can sleep soundly here at home. But as powerful politicians beat the drums of war and ratchet up tensions between the United States and nuclear-armed countries like Russia and China, the front lines have come to our doorstep, as we sit on the precipice of nuclear war. Right now there are around 14,000 nuclear weapons in the world — many of them far more powerful than the bombs dropped on Hiroshima and Nagasaki — enough to destroy the world many times over. Throughout the 20th century, during a Cold War with the Soviet Union, we were told we had no choice but to live with the fear that at any moment, we could be annihilated by nuclear war. Children in schools practiced reacting to a nuclear alert, hiding under their desks. People who could afford it, built bomb shelters. The rest wondered if they would survive. With the dissolving of the Soviet Union, that danger was supposed to have disappeared. But our leaders failed us. In fact, today, we face greater risk of nuclear catastrophe than ever before in history. The President’s most important responsibility is serving as Commander-in-Chief. I will do so as a soldier who understands the seriousness of this responsibility. I want to take a moment here to recognize and express my appreciation for our fellow veterans who have joined us here today. Those of us who have experienced firsthand the cost of war, fight hardest for peace. I served in Iraq in a medical unit, where every single day I was confronted with the high cost of war, and who pays the price. I take seriously the responsibility of securing our nation. I know that weakness invites aggression and that our men and women in uniform stand ready to take on and defeat those who threaten the safety and security of our people. I also know that our current foreign policy is undermining our national security, depleting our resources, and exhausting our military. As your commander-in-chief, I will work to end the new cold war, and lead us away from the abyss of a nuclear war that could destroy our world in mere minutes. I will build partnerships with other nations based on shared interests, leading with a foreign policy based not on conflict but on cooperation. I will end the regime change wars that have taken far too many lives, cost trillions of dollars, and and undermined our security by strengthening terrorist groups like al-Qaeda and ISIS. I will have the courage to meet with both adversaries and friends in the pursuit of peace and our national security. If we lack the courage to meet with those we disagree with, the only alternative is war. 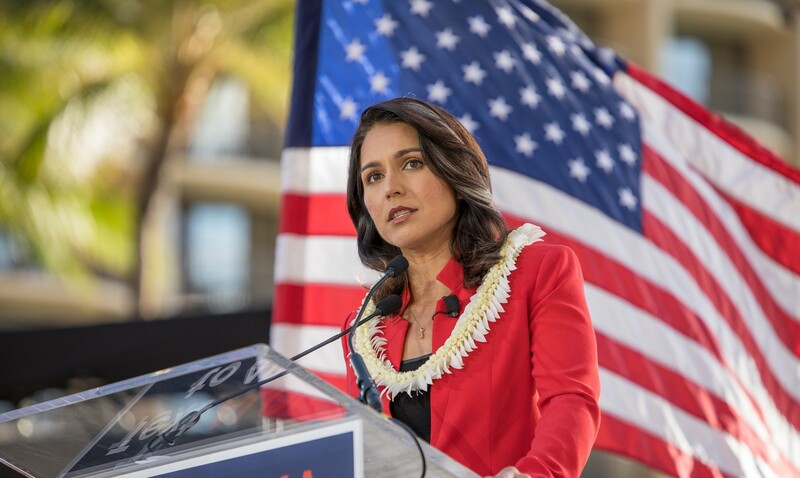 Bending the arc of history away from war and toward peace … will require every one of us to stand up against the military industrial complex and powerful, self-serving politicians who have a vested interest in perpetual war. When I was deployed to Iraq in 2005, there was a big sign at one of the main gates to our camp that read: IS TODAY THE DAY. It was a stark reminder. From the time I woke up, to the time I went to sleep, I knew that any day could be my last. It made me reflect — How am I making the most of the time that I have? This is the same reality that faces us today. We have no time to waste. There is too much at stake. The choice is ours. In order to make this change, every one of us must answer the call … to put service above self, putting the interests of our country before our own. Motivated by love for each other and for our country, we will stand up, we will take action, and we will overcome. Love should not be mistaken for weakness. There is no force more powerful than love. It is love that causes firefighters to run into burning buildings to save the lives of total strangers. … that drives a mother to run in front of a speeding car to save her child’s life. … that inspires a soldier lay down their life to save the lives of others. Love inspires us to care for each other, fight for each other, for our freedom, for our country. What our country needs now more than ever is the spirit of aloha — the spirit of respect and love for one another and love for our country. And this is the the most precious gift that Hawaii has to offer to our country and the world — aloha. Aloha is so much more than just hello or goodbye. Aloha means that I come to you with an open heart, I respect you, I have love for you and care about you. Whether a friend or a stranger, I come to you with aloha — regardless of the color of your skin, where you come from, how you worship God, who you love, or what political party you belong. “As I looked at all of these various faces and various colors mingled together like the waters of the sea, I could see only one face — the face of the future!” (“Dr. King Reports on Trip to Hawaii,” Dexter Echo, 4 November 1959). Our nation was founded on the values and principles of putting service above self — rejecting the rule of kings who prospered from the sacrifices of the people, and forming a new nation founded on the premise that leaders should be motivated not by serving their own selfish interests — but by a desire to be of service to the people. Deep inside the heart of every American is the love, honor, courage, and ideals that formed the foundation of this country … ideals that still shine in each and every one of us. Each of us and all of us must rise again now and come together for each other, our country, and the world. Our cause is to create a new and different path that reclaims our destiny and restores the uniquely American ideal: to seek a higher purpose greater than ourselves, to put service before self. That is the cause that is calling to every American today. So I’m asking you to stand with me, to build a movement for peace at home and abroad … that will fulfill the promise of America, of freedom, justice, equality and opportunity for all. Thank you — mahalo and aloha!